The University of Illinois Springfield Survey Research Office has released the results of its 2017 Sangamon County Citizen Survey. Results were previewed at the Citizens Club of Springfield meeting on Friday, July 28. The survey — the third in a planned series of five — aims to establish benchmarks and evaluate changes in residents’ assessments of quality of life in Sangamon County. In addition to responses to recurring questions, the current survey solicits public opinion on topical issues affecting the county. The current survey finds that majorities rate the county highly on many measures: 69% say it is an “excellent” or “good” place to live; 66% say it is an “excellent” or “good” place to raise children; and 59% say it is an “excellent” or “good” place to work. However, younger respondents and nonwhite respondents are less likely to say the county is a good place to live, raise children, work, and retire. 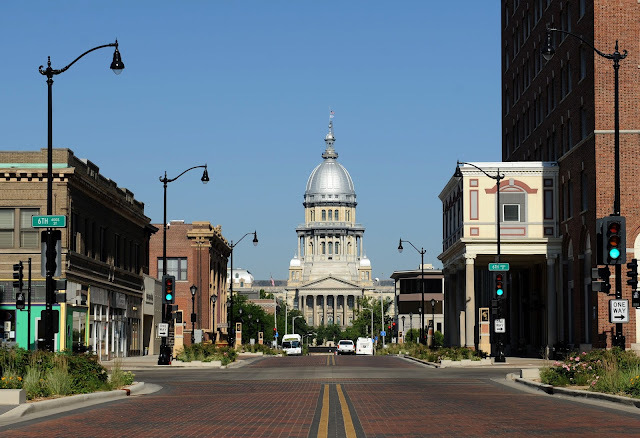 Additionally, those outside of Springfield are more likely to say Sangamon County is an “excellent” or “good” place to raise children (83%) than Springfield residents (62%). The survey also finds that men (47%) are more likely than women (36%) to say that everyone in their community is treated equally and that those with household incomes of $100,000 or more (53%) are more likely to say everyone is treated equally than those earning $30,000 or less (37%). Respondents are nearly unanimous when it comes to how they feel the budget impasse has impacted the county; almost nine in ten (88%) say the state budget impasse had a negative effect on the Sangamon County economy. Furthermore, about half (44%) say they have personally been affected by the state budget impasse. Among those affected are state employees who have not been reimbursed for medical payments and small business owners who depend on business with the state to survive. Regarding the local economy, just 20% say they are financially “worse off” now compared to a year ago today while 24% say they are “better off” today. However, respondents are less optimistic about local business conditions – 46% say these are “worse off” now than compared to a year ago while just 4% say they are “better off.” Thirty-six percent say they have considered moving out of or away from the county in the past year which is the same percentage as the last time the survey was administered in 2015. The survey is sponsored by the Community Foundation for the Land of Lincoln, the United Way of Central Illinois, and the Center for State Policy and Leadership at UIS. The full report contains responses to all questions including open-ended questions. The results are from 746 respondents from across Sangamon County. The data are weighted by gender, race, age, and education to match estimates provided by the U.S. Census Bureau. The survey was administered via mail using address-based sampling. The margin of sampling error is +3.8% at the 95% confidence level, but this margin will increase when examining subgroups. The report is available on the UIS Survey Research Office website at www.uis.edu/surveyresearchoffice. Questions about the survey may be directed to Matt Case, interim director of the UIS Survey Research Office, at 217/206-6293 or mwcase2@uis.edu.